Wing span: 1 1/2 - 2 1/4 inches (3/8 - 5.7 cm). Identification: Upperside is orange-brown with an orange bar at the leading edge of the forewing; hindwing with 3 or 4 blue submarginal spots. Underside with complex pattern; eyespots are obscured by other markings. Life history: Males perch to watch for receptive females. 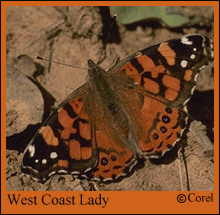 Females lay eggs singly on upperside of host plant leaves; caterpillars eat leaves and live in a silken nest. Adults hibernate. Flight: Many flights throughout the year in lowland California; two flights, summer and fall, in the Rocky Mountains; one flight in higher mountains. Habitat: Open places including weedy areas, gardens, roadsides, fields, foothills, chaparral, disturbed areas. Range: Western North America from southern British Columbia south to Baja California Norte; south and east to Montana, Colorado, New Mexico, and Mexico. Strays to central Kansas, eastern North Dakota, and southern Ontario. Management needs: Occasionally causes minor damage to hollyhock (Althaea) leaves.